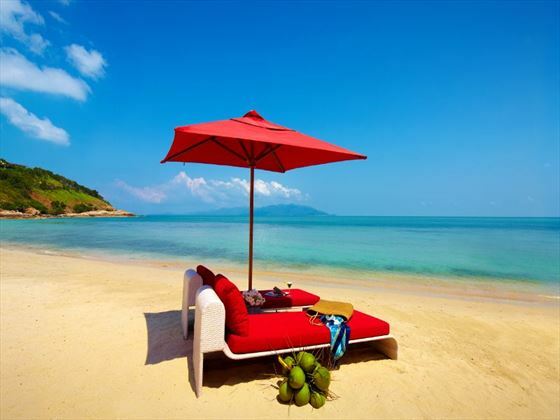 Boasting a wonderful location on a private beachfront in the north of Samui, Melati Beach Resort & Spa is a luxurious property that’s ideal for couples and families looking for a relaxed holiday in Thailand. 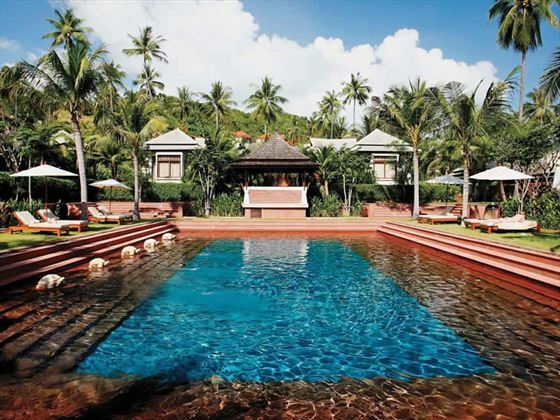 Individual villas with private pool and low two-storey buildings are scattered amongst the lush tropical gardens and the resort has everything you need on site to keep you happy – lounge by the pool, dine in one of the two restaurants or indulge at the spa. 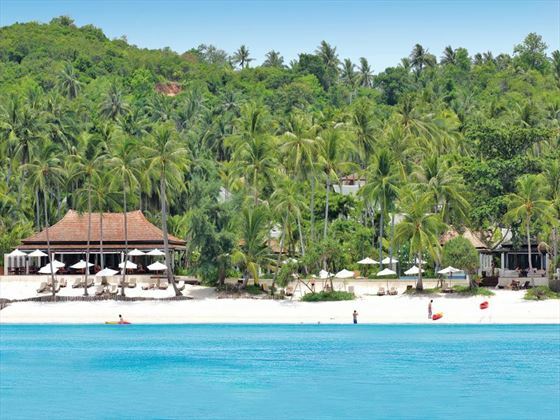 It’s close to Chaweng Beach too – catch the hotel’s shuttle bus there whenever you’re looking for fun and entertainment. 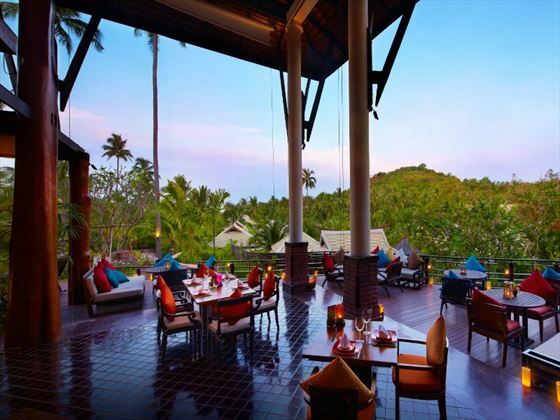 Melati Beach Resort & Spa has won the Haute Grandeur Global Hotel Awards 2016 for 'Honeymoon Hideaway Resort' in Thailand. 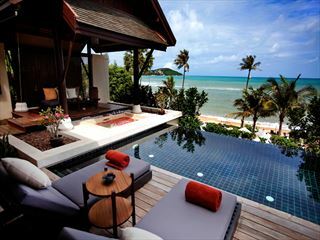 Tucked into the north-eastern tip of Koh Samui, the resort is stretched out on a pristine curve of sun-kissed sands and sparkling teal waters. 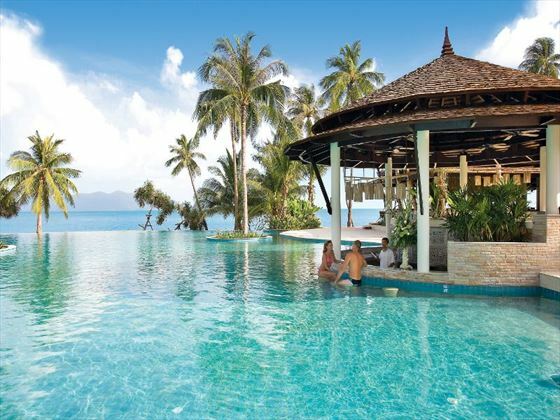 Whilst boasting a convenient location, the rich tropical forests and serene beachfront that surround the resort create a heavenly atmosphere that overflows with tranquillity. 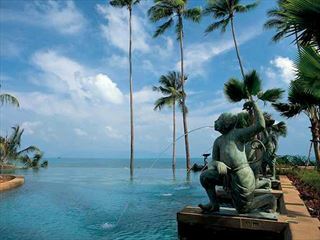 In-between blissful days spent relaxing on the beach and around the pool, you’ll be situated in a fantastic spot to explore Koh Samui’s incredible highlights, with two of Samui’s most renowned attractions located just under 10 minutes away: the unmissable 12-metre high golden Big Buddha, which can be spotted from several kilometres away, and the vibrantly ornate Wat Plai Laem temple. Bophut Fisherman’s Village is just over 15 minutes away, offering beautiful rustic-style architecture, boutique shops and lovely restaurants from where you can witness the magnificent Thai sunset. Every Friday, the village takes up a bustling atmosphere with its walking street market, attracting huge numbers of visitors from all around the island. 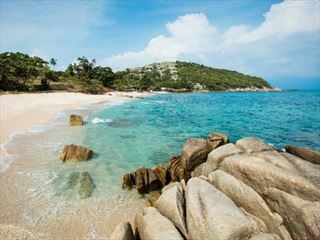 You’re also placed in close proximity to the popular Chaweng Beach if you fancy exploring more of the eastern coastline. 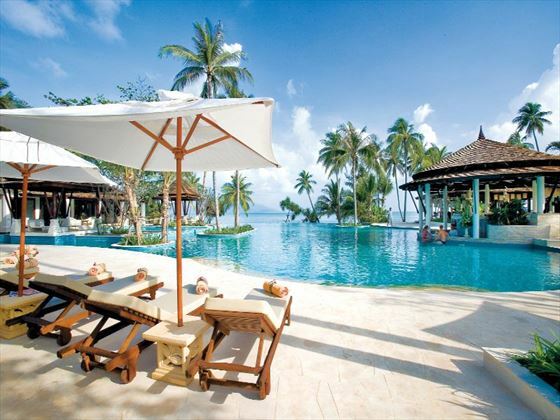 The resort is approximately a 10-minute drive away from the airport. The resort has a fantastic kids club for the younger travellers to enjoy. Meals - Breakfast daily (from 06:30 to 10:30 am), Lunch and Dinner (3 courses meals, consisting of starter, main course and dessert) from an a la carte menu at either at The View (all day dining restaurant) or Kan Sak Thong Thai Restaurant (fine dining restaurant open for dinner only). Guests may join Theme Buffets, with the exception of Seafood Buffets and the Dining Under the Stars menu. Some dishes marked as Special Dishes or Chef Recommendation at Kan Sak Thong and The View are not included in the package. Drinks - Open bar, from 10:00 am until 22:00 pm at both the Pool and Beach Bar and during meals - including House Brand Wine by the glass, Alcoholic Beverages and Domestic Beers, Soft Drinks and Ice Cream. You are requested to provide a copy of a valid Wedding Certificate on booking and upon check-in. 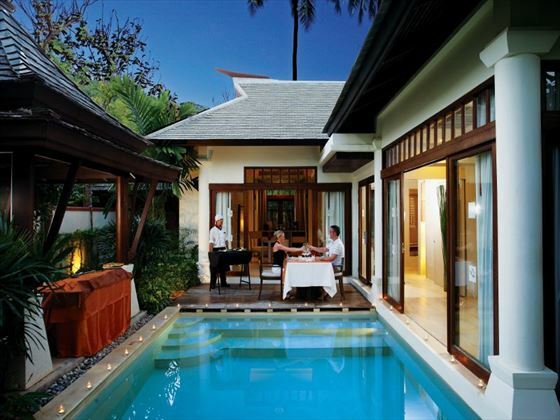 Special offer Save up to $230 per couple for stays until 9 Apr, 25 Apr-31 May, 1 Sep-20 Dec 19. Book by 30 Apr 19. Applicable to all room categories excluding the Presidential Suite. Valid for travel 1 Mar - 9 Apr, 25 Apr - 31 May & 1 Sep - 20 Dec 19. 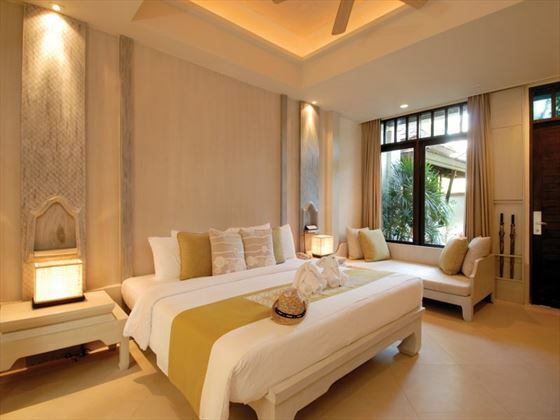 Excluding the Pool Villa Suite and Family Pool Villa from 6-8 Apr 19 only. Combinable with Early booking offer and Long stay offer. 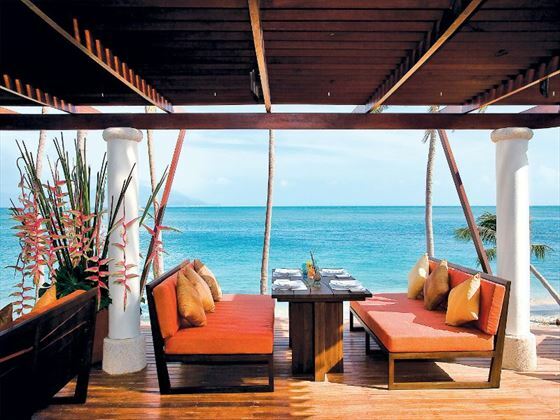 Long Stay offer Guests staying a minimum of 14 nights will receive one free dinner per person. Excludes 24 Dec - 6 Jan 19; 1 Jul - 31 Aug 19 and 24 Dec - 6 Jan 20. Family Plan First child under 12 sharing with adults receive a complimentary bed* and second child pays only THB1000 on a B&B basis per day. Breakfast is compulsory and chargeable for first childd.